Is your pet over weight, under weight, or a couch potato? Our Pet Fitness coach will exercise your pet using a personalized regime that will be created based on your pet?s age, ability, health condition, temperament, and preferences. Our pet fitness program is also good for pets who need physical therapy. We provide?programs for pets with special needs such as orthopedic, disabled, etc. Dogs of all breeds and sizes can benefit from our fitness programs. No dog is to young or old to get started. Our fitness program caters to the complete dog. We focus on your pet?s total health physically and mentally. Depending on your pets needs we do running, jumping, walking, cardio, therapy strength training, etc. Pet Fitness Programs for Puppies? ?We have several fitness programs for puppies also to make sure your puppy is growing properly and getting in the habit of healthy exercising. We use all your puppies energy in a positive way to make sure you have a healthy puppy mentally and physically. We have many games your puppy will love and you could do at home. 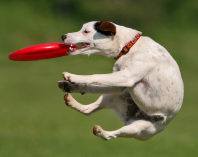 When you hire Pet Pros fitness trainers, your pet will receive top of the line care. By hiring a professional pet fitness instructor, you can experience peace of mind knowing that your pet is receiving daily food, water, exercise and love while you are away. No need to worry whether or not the neighbor accidentally forgot about ?your four-legged family member.? Pet Fitness Programs Are Available for Cats Too! Questions about our innovative pet fitness programs? Please call us at 1.888.9 PETS 4 U (888-973-8748)?and we will be happy to speak with you!